In remembrance of a loved one. 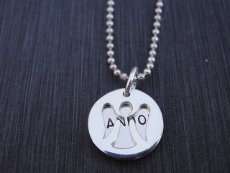 This sterling silver disc is layered with a cut out Angel disc. 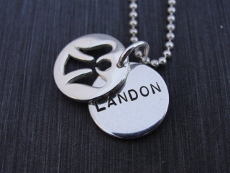 The 1/2" disc is stamped with a block or lower case font and can hold 7-8 letters and may be stamped on the back. The disc is hung from a sterling silver ball chain 16", 18" or 20" lengths.